Lee Odden is the CEO of TopRank Marketing a first-class search, social, email and online PR consultancy based in sunny Minneapolis. A conference legend, Lee speaks somewhere in America about digital marketing on a seemingly daily basis. He is widely recognized as a leader in the convergence of historically separate tactics like search, PR, and social media. He’s also a vocal advocate for social media strategy over tactics, and a hell of nice guy. Selected this photo of Lee joined by Ford’s Scott Monty as a conduit for a shameless plug for the archives of the Twitter 20 interview series (Scott Monty was the first person I interviewed on Twitter, in October, 2008). Check out this live Twinterview from April 8, 2009 as Lee delivers solid, actionable advice on search optimization, social media, and the perfect client. 1. @jaybaer: You’ve had TopRank Marketing since 2001, and been in the digital biz a lot longer than that. What’s changed the most? 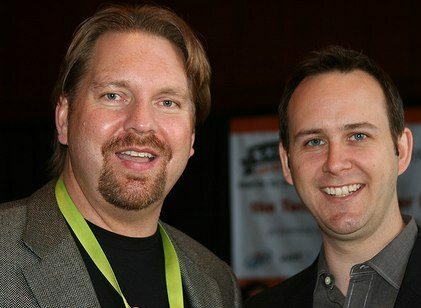 @leeodden: Digital marketing/search circa 2001 used to be one-way message to consumer. Now searchers expect to interact with what they find. Marketing has become a two way channel and companies are thinking more like content publishers. 2. @jaybaer: Given those changes, do you look for different skills now in prospective employees? @leeodden: Yes new employees need creative communication & problem solving skills, social & technical skills more than set expertise. Expertise in digital marketing is a moving target & our staff need to be flexible & able to learn quickly, adapt quickly. 3. @jaybaer: As you say, searchers want to interact with what they find, but many clients still want a magic SEO wand. Difficult? @leeodden: Magic wands are for Harry Potter 🙂 SEO is pull marketing but content discovered is where engagement happens. SEO is part of a content strategy & works best holistically. Content optimization plus links should be a corporate process. 4. @jaybaer: You’ve spoken about digital asset optimization http://is.gd/rqXj Is video a must-do for most companies, or overblown? @leeodden: Video as part of a DAO strategy http://is.gd/rqXj can be very effective. What matters is customer/influencer reach. Video can be embedded, segmented/repurposed into text, images, podcast – all optimized for search. Many possibilities. 5. @jaybaer: Are you saying that an important criteria in video go/no-go is audience targeting? Who will see it and in what context? @leeodden: Yes on several levels. Is video often consumed, passed along by target audience? If not then maybe other formats are better. 6. @jaybaer: One of your services at TopRank is online PR. How does it differ from traditional public relations? @leeodden: Online PR differs from traditional PR in that the news publishing & consumption happens via the web vs print or both. Web PR focuses on web based networking & communication channels, centers of influence, direct & secondary distribution. Web PR involves search, social media and media/blogger relations. We optimize news for journalists vs consumers – Pull PR. 7. @jaybaer: I’ve written about which type of agency should “own” social. Ad, digital, or PR. http://is.gd/rr9o Your thoughts? 8. @jaybaer: You Tweeted about that earlier today. What do PR agencies need to add/change to sufficiently “get” social media? @leeodden: PR agencies will “get” digital, including social media, by participating. Immerse, get involved, interact, not just promo. PR needs to add value to social engagement for companies or they’ll just do it themselves. Need to speak like a native. 9. @jaybaer: You’re doing a killer SM training on 4/22 http://is.gd/rrgk Emphasis? Where do people need help re: social media? @leeodden: Our next SocialMediaSmarts.com event is NYC 6/4-5 http://bit.ly/socmedsmart – Big opportunity is strategy before tactics. Many companies approach social media via 1 tactic w/o thinking of business benefit, measurement, audience, big picture. 10. @jaybaer: Yes! Strategy 1st! Is lack of strategy thinking what defines the breed of social media “Charlatans” you’ve mentioned? @leeodden: Promises people/companies make in their abilities, esp opportunists, should be kept or it’s like being dishonest. I’m biased towards a social media roadmap but it’s entirely reasonable for a co. to experiment before full socmed engagement. @leeodden: Search metrics and social media metrics are not apples to apples, but accountability applies to both. Social media is a new model, so different goals, value measurement & outcomes. Social helps both SEO & PR results. 12. @jaybaer: Your blog is outstanding http://is.gd/kSom and is massively read. Many bloggers don’t think SEO. Tips for them? @leeodden: Thanks, our blog aims to be useful via contributions from@twistermc @coltsfan18 @dlarson15 & other TopRank Tweeple. 13. @jaybaer: How do you feel about the controversy of Google “overranking” blogs compared to traditional news outlets? @leeodden: News is news right? In a Google world, the web decides most important sources by clicking & linking to best sources. 14. @jaybaer: There’s been talk lately about social networks killing email. I disagree. How about you? Curtains for the email biz? @leeodden: Socnets aren’t killing email any more than RSS killed email. Email is a big part of socnet communications & distribution. 15. @jaybaer: Does the ++ proliferation in content volume (blogs, podcasts, etc.) make it easier or harder to market online? @leeodden: Exponential growth of content online makes it seem harder to market, but not if you’re smart, always learning, testing. The great thing about marketing online is there are multiple ways to help companies reach goals. Smarts+Creativity wins. 16. @jaybaer: You’re a conference regular & an in-demand speaker. All part of the TopRank marketing plan, or you just love planes? @leeodden: LOL conferences are definitely part of the TopRank Marketing plan. Biz is booming due to blogging, social media, events. 17. @jaybaer: How do you feel about the Twitter back-channel at conferences? Useful augmentation, or distracting? @leeodden: The Twitter backchannel at events is both useful & distracting. I think the pos+ outweigh the cons by a lot. 18. @jaybaer: I know you work w/ DMA, PRSA & others. With so much free content, and tons of conferences, how can orgs stay relevant? @leeodden: Industry associations have a lot of work to do re: social web. Those that do the best job of creating value will persist. 19. @jaybaer: It’s great that biz is ++ for Top Rank. What’s a perfect client for U? How do U differ from huge guys like iCrossing? Safe to say we don’t have the overhead of a huge agency. We’re innovative, smart & client focused. We walk the talk too. 20. @jaybaer: You and I got involved in online about the same time (94?). You obviously dig it. What drew you, & what keeps you here? @leeodden: Last question of the Twinterview! Online marketing keeps me on my toes, but also enables a high level of effectiveness. Am fortunate to have an awesome team at TopRankMarketing.com that shares a passion for clients, learning & results. Thanks to Lee for a fantastic interview. Who would you like to see on future editions of Twitter 20?